Beervana Fest ’18: The beer list! OK, folks, it’s the post you’ve been waiting for all year — the exclusive Beervana Fest beer list [all beers and breweries subject to change]! It is . . . rather impressive [that’s an understatement]! Take some time to soak in the massive array of fermented magnificence and get your game plan ready for Rhode Island’s Unparalleled Beer Event®! Beervana 10th Anniversary Blend – A multi-layered ale brewed with sauvignon blanc must and fermented in chardonnay barrels. Defined by its balanced and complex notes of pear, citrus, and tart grape. Farm To Face – Drinking this medium-bodied beer is like biting into a juicy, yet tart, peach. Farm to Face is brewed as a pale ale and then fermented for ten months in stainless tanks with house yeast. After primary fermentation, Pediococcus, Lactobacillus, and a whole lot of peaches are added. Aromas of green apple and graham cracker accompany a lingering peachy finish. Beerdvana – Simcoe, Galaxy and Falconer’s Flight New England IPA. Cold as Weiss – Kettle-soured berlinerweiss with raspberry. Radical Sandwich Anarchy – Radical Sandwich Anarchy standpoint and layered with juicy Simcoe, Amarillo and Motueka hops between rich flaked oats and wheat before topping it with tangerine puree, vanilla bean and lactose. Pipeworks collaboration – Simcoe, Citra, Mosaic hops; grain: golden naked oats, flaked wheat flaked oats; should finish at 6.5% ABV. Thornbridge – St. Petersburg Imperial Stout Aged in Highland Whisky Barrels 2006 – Vintage Russian Imperial Stout aged in Highland Scotch Whisky barrels, from England. Christian Drouin – Sour Poire 2016 (Pear cidre) – Slightly sour, 100% natural pear cider from Normandy, France. De Dues – Tocatta 2014 – Vintage, peated barleywine/strong ale from Spain. Birrificio Barely – BB10 2010 – Vintage Italian barleywine, brewed with Cannonau grapes. LoverBeer – BeerBera 2016 (Magnum Bottles) – Italian sour ale, fermented in oak vats with Barbera grapes. Grado Plato – Cantus Caeli 2011 – Italian strong ale, brewed with honey and Castelnuovo Don Bosco grapes and fermented in white wine barrels. OEC Brewing – Æther – Brett forward wild ale, dry hopped with Hallertau Blanc & Loral. OEC Brewing – Clavis Purpura 2017 (timed pour #1) – Blend of spontaneous ale and oak fermented kombucha with blueberries and blueberry juice. Done in conjunction with Potions Magical Elixirs. OEC Brewing – Slasus Oryza 2016 (timed pour #2) – Blend of barrel-aged gose and namesake from Kiuchi. OEC Brewing – Vindemia Noir 2017 (timed pour #3) – Wine barrel-aged, dark sour ale, aged on our Chambourcin and Cayuga grapes. Affinity Bound – DIPA brewed with Citra, Galaxy, and Mosaic hops. The oat-heavy grist lends a full body and pillow soft mouthfeel. Tastes and aromas of candied pineapple, mango, and kiwi. Oscillation – Our rotating IPA series we do. This is the 14th in the series. It’s a double IPA. Backwoods Adventure – Flemish-inspired Wild Sour Ale, aged in oak barrels. 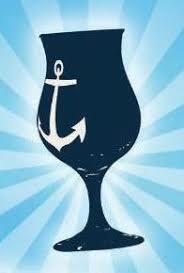 Stone/The Bruery “Fahrt Die Ziege” – Barrel Aged Imperial Wheat Ale with blueberries. Brewed in Berlin, Germany. We brewed an Imperial Wheat, aged it in barrels for four months, then brewed again, this time with fresh blueberries sourced from neighboring local Dörrwerk, The final blend is 2/3 aged and 1/3 fresh brewed, yet 100% full of San Diego bravado, Orange County creativity, and old-school-meets-neue-schule German brewing. Belgian Tripel – Strong golden Belgian style ale, full mouth feel followed by residual sweetness with fruity apricot. 8.5% ABV. 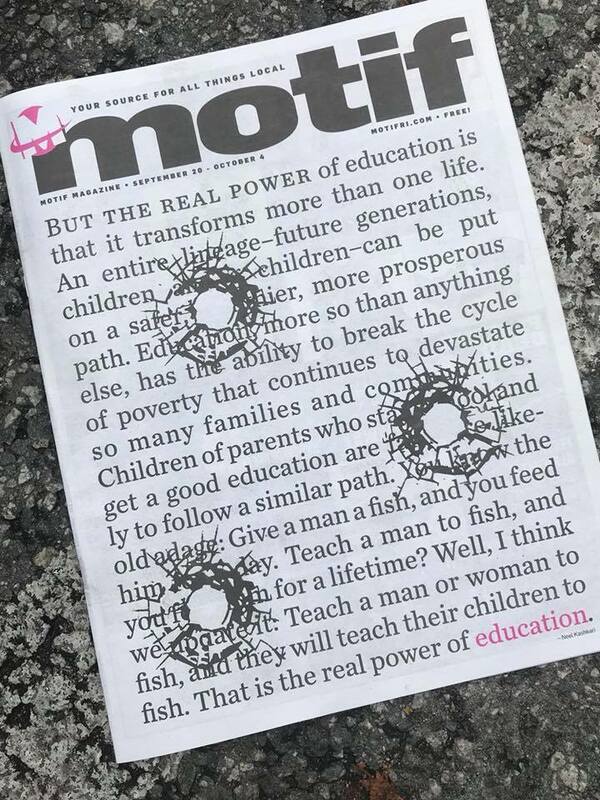 In our column in the brandy-new Education issue of Motif, we stray a few miles from 401Land to catch up with two new breweries in Fall River and the big doings at Beer’d Brewing in CT, and share some intel from Long Live, Ragged Island, and Foolproof. Click here to read the HTML version; the Virtual Newspaper Experience hasn’t been added to the “Newest Issue” link @ the top of the page [as of 9.20 @ 8:25 am], but it will be there eventually . . . .
Beervana Fest 2018 — the 10th edition — is less than a month away! It’s happening on Friday, October 12 from 6:30-10 pm at Rhodes-On-the-Pawtuxet in Cranston. Here’s an exclusive look at the list of participating breweries [nah, we’re just kidding, the info was sent out by the Beervana brain trust a coupla days ago…we were having a flashback there]. Click here to get tickets! 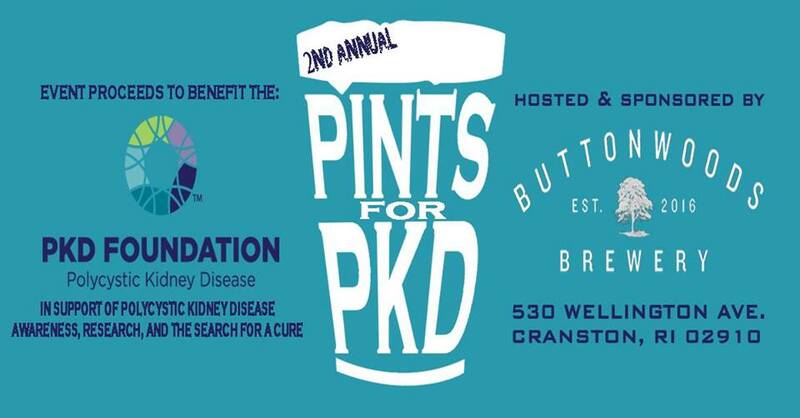 Pints for PKD, the second annual gathering to support the Polycystic Kidney Disease (PKD) Foundation, will be held at Buttonwoods Brewery [530 Wellington Ave, Cranston] on Sunday, September 16, from 12-3 pm. Raise your glasses with us in support of polycystic kidney disease awareness, research, and the search for a cure! Hosted by The Marshall Family with the generous support of Buttonwoods Brewery and the Rhode Island Brewing Society, this year’s event hopes to build on and continue the success of last year, that helped raise over $3,300 in support of the PKD Foundation. Check the event Facebook page for updates re: raffles, swag, and other enticements. In our column in the brandy-new Fall Guide issue of Motif, we share the latest beer-soaked intel from Revival, Ragged Island, and Smug, and tease the fall’s big [and little] beer happenings. Click here to read the HTML version and/or click here and swipe to page 20 for the Virtual Newspaper Experience.